The December holidays are always a tricky time of year for me. I’m not much of a Christmas person, so usually I find myself vaguely annoyed that business-as-usual shuts down for three weeks while everyone murders trees and buys lots of crap for each other. However, it’s also been a breathtakingly busy year for me, so having a little bit of time to reset was very much a welcome respite from the ravages of my regular publishing schedule. What did I do in my down time? Well…art-related things, of course. You can take the girl out of the art world, but you can’t take the art world out of the girl. First up, a visit to Las Vegas–belated birthday gift from my inimitable sister. To be honest, Vegas is not really my usual style, but as someone needing a break from the norm, it was perfect. Of course, we’re no sooner settled in on the strip, then I’m dragging Sophie out for a off-road adventure to see Double Negative, a work of land art by Michael Heizer that is unceremoniously situated in the middle of nowhere desert, Nevada. If we hadn’t encountered a mysterious local (and subsequently had a hilarious exchange with him name-dropping the Dia and speculating about the long-anticipated work, City) right at the point where the dirt road became a dusty and indistinct track leading into nothingness, I doubt we’d have found it. Bless my sister for hanging in there, when there was at least a decent chance that we would never be heard from again. I will say, though, it was totally worth it. 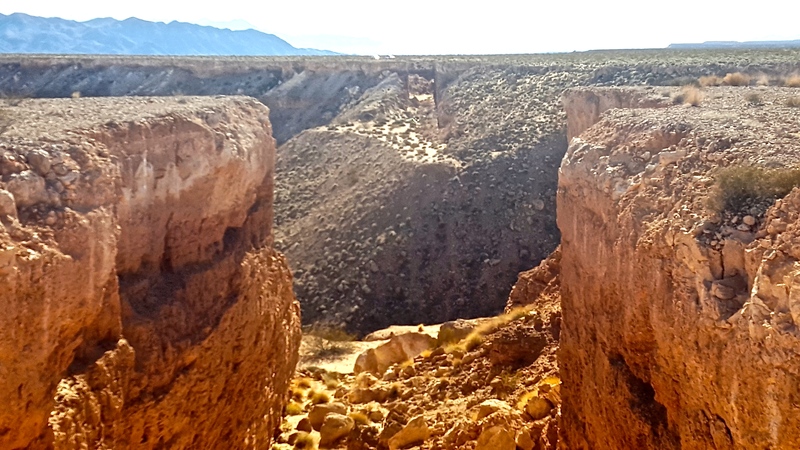 In brief, it looks as though someone took a giant circular saw to a bit of canyon, causing two large cuts that mirror each other perfectly across an open expanse. One of the things that is so awe-inspiring about canyon lands is looking at these incredible formations and realizing they were made by nothing but time and water (to misquote Corinthians 13:4 and the Tao Te Ching, “Water is patient and never gives up.”) But Double Negative is something else. It is manmade, the will of a man pitted against landscape. Creating something almost invisible initially–from the side we approached, it could have been mistaken for a rock slide–but when you walk around the rim to the other view, there is a moment that the cuts clearly align, and it is spine-tingling. Like finding crop circles. That it is accompanied by nothing, not even a sign, in way of explanation, leaves you with a truly alien feeling. This was very much on my mind as we made our way back to Vegas via Valley of Fire State Park, stopping to take a hike through the petroglyph canyon. I absolutely love petroglyphs, and have never seen this many before; whenever I’m in a preserve of human history, I try to imagine seeing the surroundings in their original context. Imagining a lone traveler, making her way through the emptiness of the surrounding desert. Being drawn, perhaps, to these outrageously red rocks, rising up in shocking contrast to the surrounding desert. 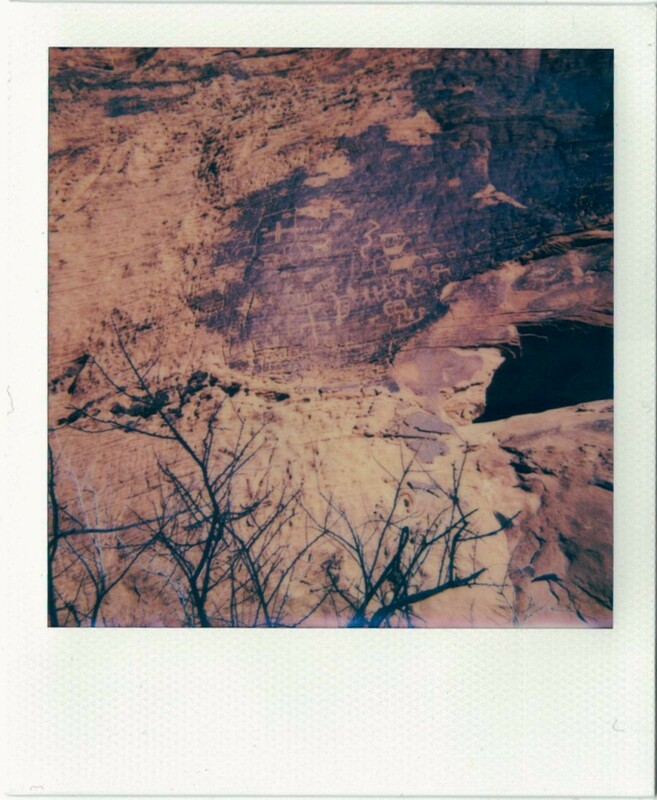 And then, in the midst of that solitude and that wonder, seeing a little, unmistakably human, figure scratched into the rocks. Then seeing hundreds of them. Sophie and I were given to speculate whether they were intended as a welcome or a menace. Anyway, refreshed and returned to Detroit, my next task was finding a place in my home for a wayward coyote. That’s the work of Michael McGillis, of course, internationally known for his ghostly canines, among other things. 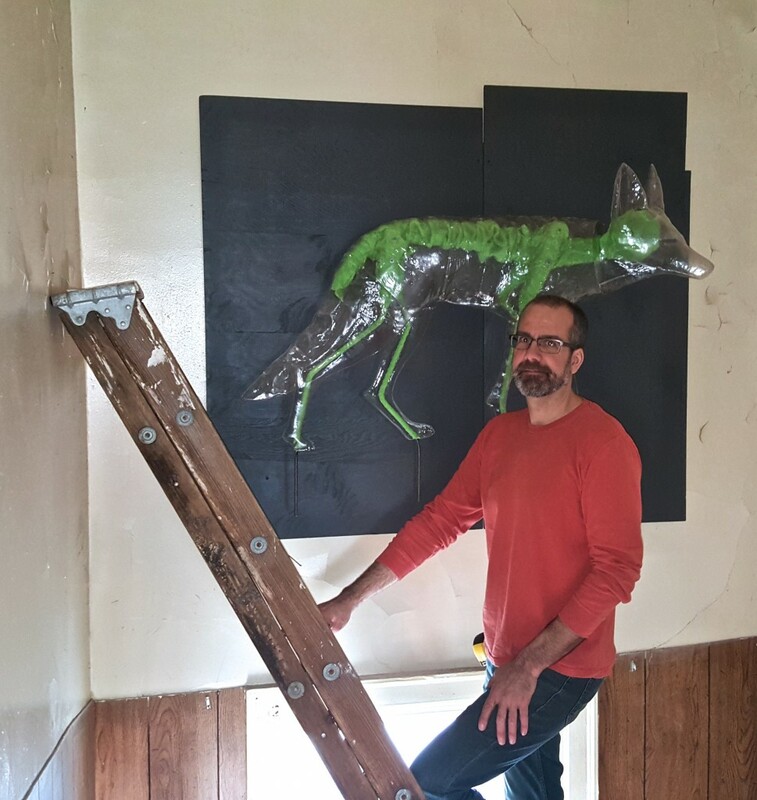 Mike braved life and limb to get this coyote mounted above the window in the vaulted back stairway, and I am thrilled to be hosting it there. Although, nothing like the presence of a great piece of art to force me to step up home renovations, including a badly needed plaster repair and repainting. And maybe some track lighting. Sigh. Add it to the 2016, to-dos. I haven’t done too much in the way of BWTA this month–it’s a busy time, and most people I know are either caught up or holed up somewhere–but I did get to cross paths with Cedric Tai this week, gracing us with a visit from Los Angeles. We had a far-ranging conversation about art and process, including some mutual hand-holding about work that we’re each struggling to shepherd into the world (ugh, is anything worse or better than trying to get a new idea safely out of your head?). New Year’s, of course, is a time of resolutions, and so I was very pleased to get my hands on my favorite of his custom calendars, part of the Edition/15 group show that just closed at Simone DeSousa Gallery. 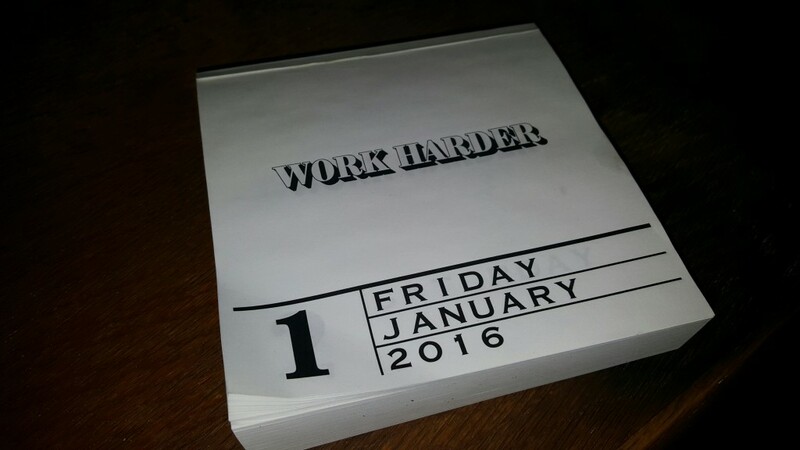 Thanks to Cedric (one of the hardest-working guys I know), I have my resolution all staked out–his daily calendar reminds you to “Work Harder” in a different font every day. Cedric says its perfect for me, because I understand the joke, which is that I work too hard already. He also shared a quote by one of his favorite art writers, on an unrelated subject: “Make sure you work more than you hope” (or something close to that…I should have taken better notes). Okay, speaking of work, I’ve got to get back to it, but on a final note, I’m excited to have used some of my downtime to work on my very own art. I make art? I make art! 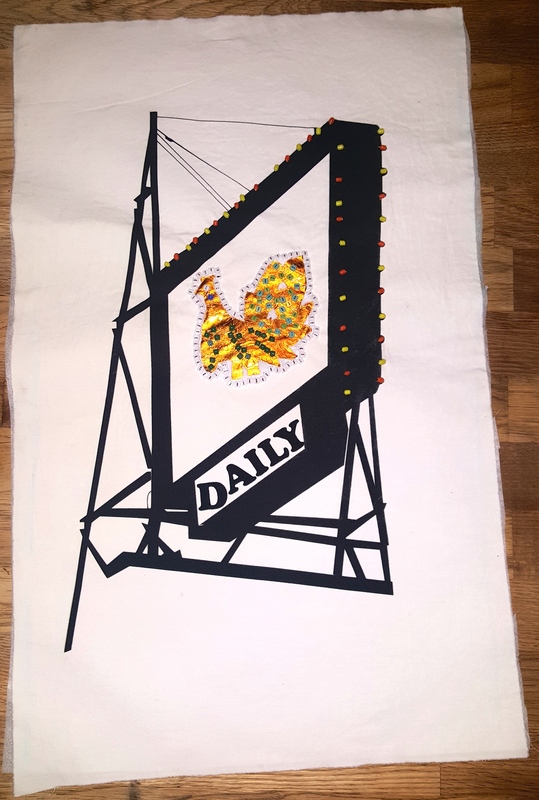 All the way back in May, friends and artists Toby Millman and Andrew “Andy T” Thompson made some blank liquor store-style signs, screenprinted on fabric, for their activity table at the Porous Borders Festival. And like a good hoarder, I grabbed a few and saved them, aspiring to really have fun with the project, when I got a chance. Fast forward, oh, seven months, and I got the chance. This will end up being the center portion of a flag that is nearing completion, but it’s been a lot of fun to work on something of my own, and do a lot of fiddly hand-beading because I’m basically insane. 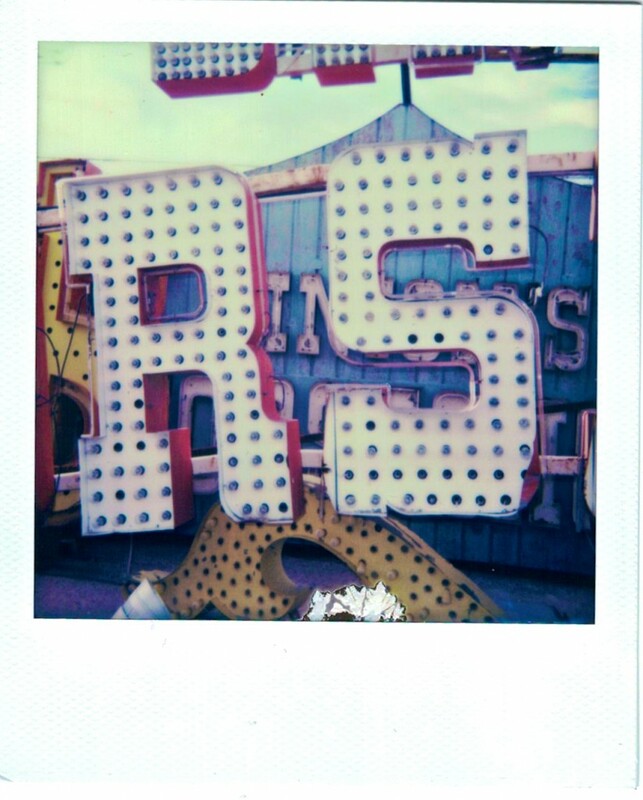 And I believe that ties it all back together to my first image, taken at the Neon Museum, which is the best thing in Las Vegas proper, so there I will leave you.